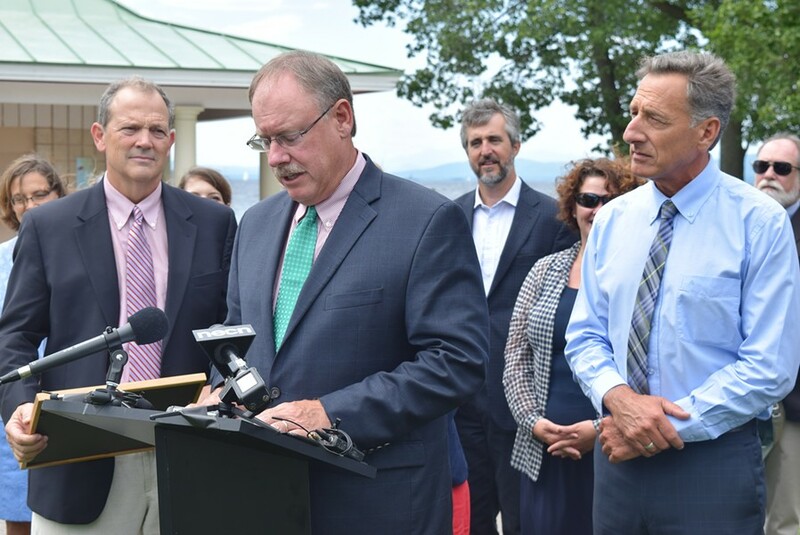 Curt Spalding, Region 1 administrator of the U.S. Environmental Protection Agency, speaks about a new Lake Champlain cleanup agreement as Gov. Peter Shumlin looks on Friday at North Beach in Burlington. Behind a row of state, federal and local officials Friday at North Beach, kids were splashing in Lake Champlain. Weeks earlier, this same beach had been closed because of potentially toxic blue-green algae. Farther north on the lake, algae blooms were proliferating. The people in the suits who took turns at the microphone promised they've got a solution that will clean the lake. "This really is a day of victory," declared Vermont Agency of Natural Resources Secretary Deb Markowitz. But the longterm solution will be expensive and will require significant changes to the way farmers, loggers and developers do business, particularly around areas of the lake where pollution is most concentrated. An agreement between the state and the U.S. Environmental Protection Agency, unveiled Friday, specifies that Vermont must reduce the amount of phosphorus going into the lake, called the Total Maximum Daily Load, by 34 percent in the next 20 years. Reductions will be more drastic in certain regions — 64 percent, for example, in Missisquoi Bay in northwestern Vermont. Some communities may spend millions of dollars to upgrade wastewater treatment facilities with new technology. The agreement does not require upgrades to all 59 of the wastewater treatment facilities in the state. Vermont officials persuaded the EPA that wastewater plants as a whole produce only 3 percent of the lake's phosphorus. But the EPA will raise standards on 13 facilities in Missisquoi, Burlington and Shelburne bays, targeting them as heavier contributors to the phosphorus load. Those changes could cost Burlington $30 million, according to a state Department of Environmental Conservation report. The total cost of the improvements in all the affected communities could be $78 million, according to the DEC.
Burlington officials are still assessing the report, Public Works director Chapin Spencer said, but he called the requirements "significant." Steve Perkins, EPA project manager, said he expects to see significant change to the lake's health within 10 years, but that in the harder-hit Missisquoi Bay and South Lake areas improvement will take longer. The plan calls for an 83 percent reduction in phosphorus from agricultural sources in the Missisquoi Bay area. The agreement means farmers will be required to follow new practices. The state will have to more specifically define how farmers manage livestock, including prohibiting cows from accessing rivers and requiring cover crops in certain areas, said Jim Leland, director of the Division of Agricultural Resource Management in the Vermont Agency of Agriculture. "You're going to see more livestock excluded, bigger buffers," he said. Many of the changes are already in the works, set into motion by state legislation passed this year. Phosphorus reaches the lake through runoff from parking lots, roads, logging paths, farm fields and lawns and poses a danger to aquatic life and humans. Limiting that runoff requires changes to all those sectors. Gov. Peter Shumlin, EPA Region 1 Administrator Curt Spalding and others at the Friday morning news conference called the agreement, which has been in the works for more than a decade, historic. But they steered clear of specifics, studiously avoiding how much it will cost, and spent nearly all of the hourlong press conference thanking and praising each other for reaching the agreement. "I get the question, 'What's it going to cost?' and I think it's misplaced," said state Agency of Natural Resources Secretary Deb Markowitz. "It's going to be an incremental cost spread over time." 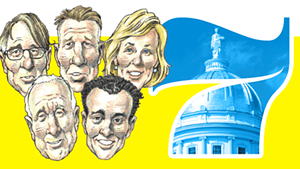 "The most expensive thing we can do is nothing," Shumlin said. The state this year started a Clean Water Fund that will draw from a 0.2 percent increase in the property-transfer tax. Private companies, including Keurig Green Mountain, have pledged money and the federal government is contributing, but Shumlin said he has no total on how much funding is available. The agreement on how much phosphorus may reach the lake comes after the Conservation Law Foundation filed a federal lawsuit in 2008 appealing the EPA's approval of Vermont's 2002 lake cleanup plan, arguing that it was insufficient. The EPA withdrew its approval in 2010. Markowitz noted that Friday's agreement would not have come without the lawsuit. 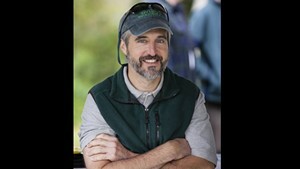 Chris Kilian, CLF director in Vermont, said he had a quick briefing on the agreement but wants to read the details. The 83 percent reduction in agricultural phosphorus in Missisquoi Bay is "unprecedented," he said. "That's a high bar." David Mears, who finished working last week as the state DEC commissioner, said he didn't know at times whether the EPA would approve the state's revised plan or if it would enact its own. Had the EPA forced a plan on the state it likely would have required expensive upgrades to more wastewater treatment plants because of the way federal standards are geared. Mears said he was intent on focusing on areas that contribute more heavily to polluting the lake.